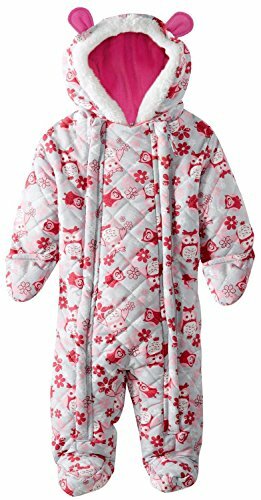 Microfiber quilted all over owl print ear snow pram. Sherpa trim around the hood. Polar fleece lined. Full double side zip opening for easy on and off. Attached mittens. Water and wind resistant. Perfect accessory for cold days. Quilted with all over owl print ear snow pram. Sherpa trim around the hood. Micro fleece lined. Fully Insulated for extra warmth. Attached mittens. Full double side zip opening for easy on and off. Perfect accessory for cold days. View More In Snow Wear. If you have any questions about this product by Pink Platinum, contact us by completing and submitting the form below. If you are looking for a specif part number, please include it with your message.